What Yellowstone Park Hotel is the best? Is it best to stay in one hotel the entire time, or move around to different locations? Lodging in Yellowstone National Park is operated by Xantara Parks & Resorts. Please call (307) 344-7311 for information about accommodations and reservations at the following locations. Read my review and notes regarding Xantara further below. As of the spring of 2013, guide companies can no longer meet their guests at any hotel inside Yellowstone Park. If you have, or are planning on hiring me for a tour/hike, you will need to meet me outside of a visitor center or nearby and easily found picnic ground/rest area. Built the winter of 1903-04, is not the oldest hotel in Yellowstone Park, but one of the more interesting and historic. The Old Faithful Inn is 800 feet long, and contains 400 rooms. Two wings were added over the years. The left wing (facing old faithful geyser, and geyser hill) was added in 1913, and the right wing was added in 1927. Rooms located in the 1913 wing, with views of geyser hill and old faithful are more expensive. The rooms within the wings all have bathrooms. The rooms located in the original structure have sinks, with showers and toilets shared in community bathrooms on each floor. The walls are a bit thin in these older rooms, but cheaper to rent. Starting the summer of 2005, the park service began remodeling the old inn, strengthening the walls, and replacing interior walls that had been removed over the years so that the inn will last many more years to come. This major project is scheduled to be completed in 2008. You may have some very minor construction in the area while visiting. 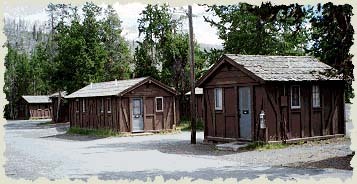 The frontier cabins are clean and each cabin I have stayed in all had a sink, and nearby communal toilets, but the showers are located in the main Old Faithful Lodge which you have to walk or drive to. The more expensive cabins all have full bathrooms. I have yet to spend a night in this new hotel, but the main lobby is very nice, and looks very high end. I was told that all of the rooms in this new hotel have phones in each room. The only lodge in the park with this service. Located on the shore of Yellowstone Lake and built in 1891, Lake Yellowstone Hotel is the oldest hotel in the park and one of the nicest, including a presidential suite on the top floor. Excellent dining room. Large, open lobby area with views of Yellowstone Lake, coffee shop and cocktail bar. The drawback to staying here is the squeaky floors. Try and get a room on the 4th floor if you can, otherwise every time a guest upstairs walks down the hall or across their room your going to get not just a simple squeak but hundreds of squeaks. Located out back of Lake Hotel and on the shore of Yellowstone Lake. The “cabins” are actually duplex’s. Lots of tree’s. I have only spent one night at Grant Village. The room I had was clean and had a full bathroom, but the walls were a bit thin. The dining room was spectacular. Located on the shore of Yellowstone Lake and not far from West Thumb Geyser Basin, and the South Entrance. Not an actual lodge, but a grouping of duplex’s out back of the lobby. Lots of shopping, and dining. Within walking distance of the north rim of the Grand Canyon of the Yellowstone. Some of the “cabins” have private bathrooms and others have communal showers and bathrooms nearby. Canon Cabins are actually duplex’s. Lots of tree’s and lots of parking space. A great place for frisbee or other outdoor games during the late afternoons, after the kids have been in the car. Again, not an actual lodge, but a grouping of cabins. This is one of my favorite locations to spend the night. The cabins are small, and the beds are comfortable. A few of the cabins have bathrooms but most do not, with community showers and toilets within walking distance. The food is excellent, and voted best in the park. The cabins are heated by small wood stove. Maid service each day replenishes the wood supply, matches, and fire starter. Some of the cabins are duplex’s, but most are single occupant. Open from early May to early October and from late December to early March. Located at Park Headquarters, this hotel is very nice. The rooms are large, some have bathrooms, others share in the hallways. A couple of larger suites on the upper floors have living rooms with TV’s. Annex Building: Over-flow guests are placed in the annex next to the main hotel. Rooms are clean, with full bathrooms. The building and rooms appear to have been built sometime during the early 70’s. The cabins (duplex’s) out back of the hotel look very nice. Some have private, full bathrooms and others share communal showers and bathrooms within walking distance. All of the cabins have covered front porches. Private, outdoor hot tubs are available for use during the winter months. Guests are required to sign up, and reserve a time at the front desk. During winter months there is a decent ice skating rink out back of the hotel and among the cabins. Ice skates are available for use through the hotel. That is a question I receive quite often. The simple answer is, they are all great for different reasons. Old Faithful Inn is without a doubt at the top of the list. You just have to stay at least one night in Old Faithful Inn during your lifetime. Lake (Yellowstone) Hotel would be second on my list. 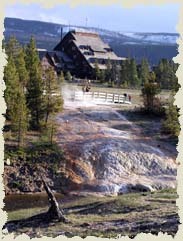 Mammoth Hotel is great if your visiting the park in winter, or touring the North end of the park. Roosevelt lodge, which are really cabins are kind of neat for a night or two. Old Faithful Snow Lodge would be a good pick if you need something new, and shiny :-). Canyon Lodge is ok, but would be a good pick if you planned to spend a lot of time around the Canyon area. 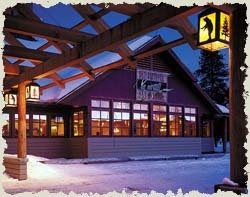 Grant Village would be a good choice if you planned to split your time between Old Faithful area and Grand Teton Park. There are pro’s and con’s to both. I think if I were only planning on visiting for 2-3 days I would probably just stay at one hotel and base my activities out of that one location. No matter what hotel you chose, you can get to just about any of the major attractions and areas in an hour or less. If you plan on staying in the park longer than say 3 days, then you might consider moving. Maybe Old Faithful Inn for 2-3 nights and then move over to Lake Hotel, Canyon, or some other hotel/cabin for 2-3 nights. Do not expect much with regards to the hotel staff in Yellowstone. Your first clue should be–Yellowstone Park is a government agency and the hotels are operated by the lowest bidder. In the words of one of my clients “the hotel staff are not the sharpest tacks in the drawer”. For most employees, it will be their first time in Yellowstone and more of a vacation, a way to spend the summer than a career choice. If someone calls and leaves a message for you at the hotel do not expect to receive it. In 24 years I have left many messages for guests and only once has a client ever actually received the message. In this case, it took 2 days for the message to go from the front desk to the guests attention, much too late for it to be of any good. The hotels do not have voice mail, and many rooms do not include a phone. Clients in the past have had packages mailed to them at the hotels. In most cases forgotten items like camera gear, medicine, etc……only to have the packages returned to the sender on arrival at the hotel. I have had clients told that they could not leave the hotel because of snow and that the park service had closed all roads in the park which turned out to be untrue. Take this information with a grain of salt. Call the park service for the most accurate information. Xantara employee’s have in the past informed clients at time of check in that they should cancel any tours they may have booked in advance, that they will get ripped off and to hire the Xantara guides and tours. With that said, you can still enjoy the park and many of the hotels are worth staying at. Just keep in mind that Xantara has no competition inside the park and your comfort is not going to be at the top of the list. You can find the rare individual who actually cares and bends over backwards to help you out but in most cases the Xantara staff members are just punching the clock. Be pro-active, self sufficient, and have lots of patience. Note: The fires of 1988 left behind many burned trees in Yellowstone park, many of which are still standing– called snags. Very little force is required for these snags to fall or drop. Caution should be used when walking, driving, sleeping, or locating a campsite. Your safety can’t be guaranteed. If you are planning on backpacking and camping in the backcountry, you are required to camp in a designated campsite. You cannot camp anywhere you want in Yellowstone Park. For more information on backcountry camping, see CAMPING SAFE WITH BEARS. Most frontcountry campsites will have at least a few sites with bear resistant, and lockable food storage box’s. The sites with “bear box’s” are generally for our backpackers, and motorcyclists. 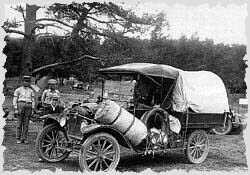 Hard-sided campers-RV’s, and tenters who drove a vehicle are required to store all food and coolers inside a closed vehicle when not being used. Unlike Yosemite, the bears in Yellowstone have never broken into a car going after food items. These are yellowstone park campgrounds you drive into and park. View a basic map of Yellowstone Park in a new separate window while you browse the list of campgrounds – Yellowstone Park Map. Five of Yellowstone Park campgrounds are operated by Xantara Parks & Resorts. Only these five Yellowstone Park campgrounds accept reservations in advance. Bridge Bay Campground: 430 sites, (flush toilets, ice, small store, marina, )- open from late May to mid-September. This Yellowstone Park campground is located right on Yellowstone Lake and at Bridge Bay Marina. The elevation is about 7500 feet. Expect colder temperatures at this campground. Not many tree’s and the sites are very open. A great hiking trail starts at the campground, back to the “Natural Bridge”. This is a short hike, only about a mile in length–one way. The largest campground in Yellowstone Park and located on Yellowstone Lake. Again, a high elevation campground, and located on the shore of the lake means cooler temps. Very close to the South Entrance. A pretty nice campground, and only 14 miles from West Yellowstone, and 16 miles from Old Faithful. Lots of tree’s and walking distance to the Madison , Firehole, and Gibbon Rivers. A large bison herd hangs out in the area up until about mid-July, and elk are common in September. A large RV campground with full hookups. Classified as “hard sided camping only”. No tents allowed in this campground due to a high concentration of grizzly bears. The sites are pretty open and not many tree’s within the campground. Located on the west shore of Yellowstone lake, and not far from Hayden Valley and the Grand Canyon of the Yellowstone. Seven of Yellowstone Park campgrounds are operated by the National Park Service and are on a first-come, first-served basis. During the height of the tourist season (late June through late-August), these seven campgrounds are full by late morning so try and grab a spot about 11:00 AM. Most folks leave their sites at about 10:30AM. This Yellowstone campground is located at low elevation, which means if you are planning on camping in spring or fall it would be one of your better choices with warmer temperatures. Five miles from Gardiner, Montana and walking distance to Mammoth Hotel, the visitor center, etc…. Showers and towels are available for a small fee at Mammoth Hotel. A pretty neat campground, with lots of tree’s. A historical cabin/museum is located at the campground. Close to Norris Geyser Basin and one of the more centrally located campgrounds within Yellowstone Park. Elk are often found in the open meadow next to the campground in Sept. and bison during summer. An easy 12 mile drive to Canyon. A very nice campground not far from Mammoth, and Norris Basin. Lots of tree’s but bears can sometimes be a problem. This campground has been forced to close during the summer a couple of years in a row due to grizzly bears smashing tents at night. No injuries. Located on the shore of Lewis Lake, and not far from the South Entrance. This campground is located in the northern range of Yellowstone between Roosevelt Lodge and Cooke City, Montana. A great campground if you are into wolf watching, but its pretty shaded and does not get much sun. Cooler temperatures. Grizzly bears are sometimes a problem, and this campground has been forced to close a few times in the past years. The smallest campground in Yellowstone, and one of the more remote “frontcountry” campgrounds. A 6 mile gravel road for access, and located in the northern range of the park, and on the banks of Slough Creek. Not far from Roosevelt Lodge / Tower Junction. Grizzly bears are common in the area. Some tree ‘d sites and some open sites. Wolves are often heard howling at dusk and dawn. A pretty nice campground, and within walking distance of Tower Falls. An easy drive to Roosevelt Lodge. Black bears are common during summer. Sites are fairly open, but there are a few tree’s. A nice hiking trail starts at the entrance road into the campground which you can hike to Roosevelt Lodge and Lost Lake. Considering a bears highly developed sense of smell, it may seem logical that they could be attracted to odors associated with menstruation. Studies on this subject are few and inconclusive. Read the data and make your own decision – Menstruation Data.